A new generation will celebrate the new direction it has given to one of Clarendon’s oldest businesses when Saye’s holds its open house this Saturday from 8 a.m. to 6 p.m.
Katie and Josh Fetsch and Savannah Askew, with their kids in tow, are the latest members to operate the family store started by T.M. Little in 1910. The business, now branded as Saye’s Tack Store, carries all types of merchandise that a cowboy needs – ropes, grooming supplies, horse shoeing tools, cinches, blankets, pads, leather goods, and more. What began as Little Mercantile Co. has changed its offerings to adapt to changing times and the needs of each era. Mr. Little’s daughter Emma May introduced a beauty salon – possibly the first in Clarendon – to the business early in its history. She married Carl Saye; and during the Depression, the store moved from its original home, where the Cowboy Church is today, to its present location at 219 S. Kearney between the Burton Memorial Library and Henson’s. At that time, the name was changed to Saye’s Clothing Store, and the business became so varied and carried such a stock, that it operated in its current location as well as occupying the two buildings that make up the city library today. Another generational change came when Emma and Carl’s son, Tommie Saye, added a photography studio to the business. Katie’s father, Danny Askew, says the store made an impression on him the first time he came in as a college student in 1974. After the death of his parents in the early 1970s, Tommie and his wife, Lucy, continued to operate the business but downsized by the end of that decade, selling the north two buildings to the city. 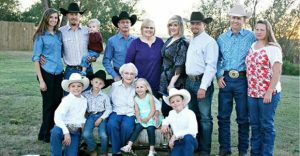 The couple eventually shifted the merchandise more towards Western wear, a trend that was continued by their daughter Terry Askew, who took over the business in 1994. “Each generation changed it a little to fit their time,” Lucy says. Terry kept the store open regularly through 2010 before going to work full-time at the Best Western Red River Inn. It was still opened though for holidays and special occasions. Lucy also said that it’s amazing to have this many generations keeping a business going, and she loves how Katie, Josh, and Savannah have repurposed Mr. Little’s original fixtures. The tack idea for the business really came about last fall, Katie said. Now Flying A Tack is the family wholesale business that travels to Texas, New Mexico, and Oklahoma to service retailers and trade shows. Saye’s is the local storefront for that service. The family invites everyone to Saye’s open house. Activities will include a roping dummy completion, and St. Mary’s Catholic Church will be providing concessions. For information, see their ad in this week’s issue. We have other ties to that old store. The daughter of Tommy and Lucy Saye (forgot her name) was the lady who sold that old piano to my mother so many years ago. Her father and mother had bought it from the Clarendon Middle School, and they had bought it from the First Baptist Church. Now, after 100+ years, it sits in the Glott house and has held up under the children’s practicing day in and day out. It has never enjoyed such attention since the days it was part of the music program in the schools. I asked my sweet young nephew Alex last night, “if you were going to give a Bible lesson, what would you do it on?” His reply was surprising and encouraging. “I think I would do it on “Want or Need?” ‘Love that thoughtfulness, especially in a ten year old!